Virtual reality is opening up new avenues in the digital entertainment industry every day. Experiences previously only the domain of dreams are now possible, thanks to virtual reality. When it comes to VR, the most commonly associated industry with the tech seems to be the gaming industry. And that is true to some extent. Gamers are usually the early adopters of this sort of technology that elevates the gaming experience. But there are a lot of other novel ways that VR tech is being utilised. One of these examples is 360-degree virtual reality experience. You might have come across a 360-degree video on Facebook and Youtube. To put simply, a 360-degree video does what the name entails; it allows you to view a scene from every possible angle. While this hasn’t exactly made its way to mass adoption, it has an important use in video journalism. 360-degree video shot in tough scenarios on the field is very valuable in placing its viewers in the feet of the people who’re present there. It should be pointed out that 360-degree video is not precisely virtual technology. In fact, it doesn’t even need virtual reality equipment to operate at all. However, VR adds value to 360-degree video without a doubt. Marketers often use words very loosely, and that can lead to confusion among the consumers. To be clear, 360-degree videos are shot using 360-degree cameras. These cameras are not VR devices. Marketers understand that VR enjoys immense popularity, so they’re happy to brand a 360-degree camera as a “VR camera”. But technology, that’s just untrue. A true VR experience allows the user to have a certain amount of control over the environment. And in a 360-degree video, you’re limited to the point of view of the 360-degree camera. 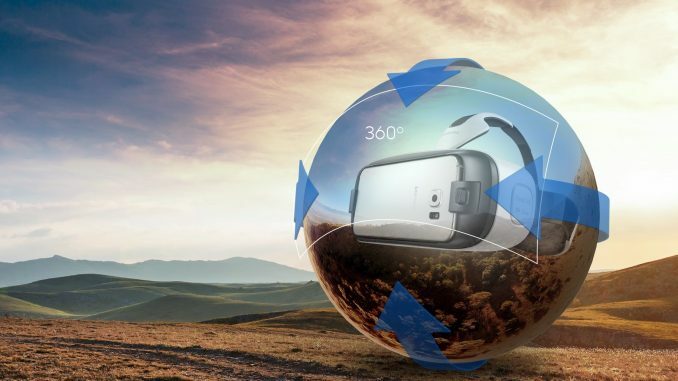 How VR Adds Value to 360-Degree Video? So how does VR add value to 360-degree video? Well, that’s because of the way VR equipment works. VR hardware like the Oculus Rift is laden with sensors that are responsible for tracking a user’s head and body movements. When it comes to 360-degree video, these sensors come in very handy. Without a VR headset, you have to drag around the video to watch it from different angles. But when you view the 360 video in a VR headset, you can turn your head to the video from your desired angle. This makes the experience far more natural and seamless. Now, VR headsets like the Oculus Rift and HTC Vive are notoriously expensive and out of reach for the majority of consumers. Not to mention that they require powerful PCs to run them. That’s where mobile VR headsets like the Samsung Gear VR step in. These are incredibly cheap and can be driven by a simple smartphone. And let’s be real, most content consumption happens on mobile devices these days. There are also significant differences in the way that VR and 360-degree products are positioned in the market. Virtual reality products are mainly consumer-oriented, while 360-degree products are going to be utilised mostly by professionals. Sure, there are some cheap 360-degree video cameras from LG and Samsung out there, but the same enthusiastic response hasn’t greeted them that VR headsets have gotten. We suspect that soon enough these entry-level products will be scrapped altogether, and the only 360-degree video equipment will be more high-end, geared towards video professionals. If you’re one of those people who’d like to have a digital copy of every important event in your life, 360-degree cameras can prove to be quite an excellent investment. With 360-degree cameras, you don’t have to worry about the placement or the angle, since they’re capturing everything in the environment anyway. Here’s a list of some of the better 360-degree cameras out there! Samsung spearheaded the mobile VR headset space with their popular Gear VR headset, and they’re looking to do the same with the very affordable Gear VR camera. As we have argued earlier, calling these 360-degree cameras VR cameras isn’t technically accurate, but whatever. This is an excellent 360-degree camera that delivers quite an impressive picture and video quality. It’s incredibly affordable, costing just $69. The Gear 360 features an F2.0 lens which is capable of shooting good quality video in low light conditions. It shoots in 4K resolution, which is impressive given the low price point. The pictures come out at a massive 30 megapixels, thanks to the independent front and rear cameras. One caveat with the Gear 360 is that official Gear 360 Manager app only works with Samsung Galaxy devices. So you won’t be able to edit the videos on your smartphone. If you’re looking for a tiny camera that’s capable of shooting some good 360-degree video, consider the Blurfix action camera. This quiet little thing will shoot full HD video at a respectable 30 frames per second. The video performance isn’t as impressive as the Samsung Gear VR camera, but that’s the sacrifice you make for such a small camera. There’s also a high-quality microphone on board which should help fight wind noise, and there’s also a built-in 1350mAh battery. It’s not as attractively priced as the Gear VR camera, but it’s not far off either. Excellent choice for anyone looking for a genuinely pocketable 360-degree video camera. This one is for the social media enthusiast who wants a pocketable 360-degree video camera. Despite its small, the NeuTab Panora packs quite a punch. It has a wide-angle lens that produces excellent panorama shots. And with just a click you can instantly share content on your social media account. You can either use the camera independently or pair it with a smartphone so you can view what it’s capturing. The camera has quite an excellent endurance rating of up to 2 hours while continuously recording video. The cameras listed above are all very good at what they do, except they’re as durable as any other piece of gadgetry. If you’re looking for a 360-degree video camera that can hold up to some serious abuse, give the 360fly video camera a look. It’s dust proof, shock proof and water resistant to 33 feet. This, in our opinion, fits the action video camera bill much better than some of the other offerings in the market. It’s not a slouch when it comes to video performance either. It can capture 1504×1504 resolution video, and the built-in battery can last more than 2 hours on a single charge. The camera is accompanied by Android and iOS apps that can even let you live stream the action. This is a very impressive little video camera and what’s more, it costs just a hair over $80. Bargain. Virtual reality is transforming many facets of online media and digital entertainment. Transforming is the right word to use here because VR has opened up an entirely new way for users to consume traditional content. 360-degree virtual reality has been around for some time now, but it still hasn’t found mass-adoption among consumers. But with the rising popularity of VR headsets, the day isn’t far off when we’ll be consuming all of our online videos in 360-degree goodness. Read more about The Best Virtual Reality Headsets.